Media release courtesy the Government of South Australia. An education campaign reminding motorists to Stay Wider of the Rider will begin today ahead of forthcoming changes to road rules regarding cyclists. Transport Minister Stephen Mullighan said the Motor Accident Commission campaign aims to inform both cyclists and motorists of their obligations on the roads. “There are new expectations for cyclists as well as motorists under these changes, so we are starting this education campaign to ensure everybody has a clear understanding of the new rules,” Mr Mullighan said. “We want to encourage more and more people to get on their bikes and get active, and increasing the physical separation between cyclists and other vehicles is one way of achieving this. The ‘One Metre Rule’ and riding on footpath changes will apply from October 25, however SAPOL have indicated a three month education period in which only warnings will be issued. Representing the Amy Gillett Foundation, Amy’s mother Mary Safe said the Foundation is thrilled that South Australia is leading the nation in safe cycling and that road rules will be permanently changed to reflect that a metre matters. 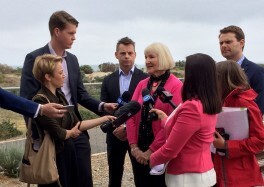 “We are also very pleased that the South Australian Government, through the Motor Accident Commission, will conduct a widespread education campaign for both drivers and cyclists to ensure the road is shared fairly,” Ms Safe said. Motor Accident Commission acting General Manager Road Safety and Strategic Communications, Matthew Hanton said the MAC funded education campaign has been developed to communicate and build awareness of the new cycling laws. “Last year four cyclists died on our roads and 64 were seriously injured,” Mr Hanton said. “The campaign being launched today will involve radio advertising in metropolitan and regional areas, bus shelter advertisements in the metropolitan area and online videos alerting people to the new laws. Motorists who do not abide by the new overtaking rule face a $287 expiation fee and $60 victims of crime levy and two demerit points. Cyclists who do not abide by the new riding on footpaths rule face a fine of $56 expiation fee, $60 victims of crime levy and two demerit points if they hold a drivers license.